The Full Scope of Practice Competency Task Force (FSOPCTF) wants to hear from you! Visit the FSOPCTF AANA member webpage (login required) to view the latest updates on the work of the task force. Members can view summaries of the task force’s recent meeting and call. This webpage also contains a comment form, where members can provide the FSOPCTF with feedback any time throughout this process. The task force looks forward to hearing from members as they continue this important work. The AANA State Leadership Workshop will inspire state leaders to lead and influence through crucial conversations and emotional intelligence. Held March 23-24, 2019, in San Diego, the workshop also will cover state board orientation, governance principles, and sharing best practices and success stories with other state association leaders. The state leadership workshops are held around the country and make the education and training of state association leaders as convenient and efficient as possible by "taking the show on the road." These critically acclaimed workshops bring expertise, resources, and tools around governance and leadership closer to the states. After 42 years of breathing surgical smoke, Julie Greenhalgh, RN, BSN, CNOR, past president of the Association of periOperative Registered Nurses (AORN), helped lead the effort for Rhode Island to become the first state to pass legislation that requires all hospitals and ambulatory surgery centers to use surgical smoke evacuation systems. The law took effect on New Year's Day. Facilities have 90 days from Jan. 1 to report that they've adopted smoke policies to the Rhode Island Department of Health. Read more about the Rhode Island story in Outpatient Surgery. Learn more about AORN Go Clear Campaign to which AANA contributed. Do You Have Malpractice Insurance Questions? AANA Insurance Services has answers! We are happy to answer your questions, whether you hold a policy with AANA Insurance Services or not. Contact us by phone, email, or through our online General Inquiry Form. CRNAs who need information about or assistance with 2018 Merit-based Incentive Payment System (MIPS) Data submission can register for online Office Hour Sessions presented by CMS on Tuesday, Feb. 26th and Tuesday, March 19, 2019. Attendees can ask questions during the Question and Answer portion or submit questions in advance. CMS also posted several videos that demonstrate how to submit MIPS data, which are available through the Resource Library of Quality Payment Program website. CRNA members attending the Assembly of Didactic and Clinical Educators (ADCE) are eligible to vote for a delegate to the Education Committee. Voting takes place during the ADCE. Check out the candidates on the AANA website. One student will receive the Education Committee Student Excellence Award at the AANA Annual Congress. The winner will be recognized at the Student Luncheon. The award will be presented to a student in good academic standing who demonstrates outstanding leadership and professionalism during their nurse anesthesia program, participates in activities that foster a positive public image of nursing, participates in activities that foster high quality healthcare to consumers, or engages in volunteer activities of community service or support of healthcare. The student must be nominated by the program administrator or the program administrator’s faculty designee. All individuals who are a student at the time of the submission deadline are eligible. Citations must follow AMA formatting style. The winner will be recognized during the Student Luncheon at Annual Congress. There is also an opportunity for the winning essay to be published in the AANA NewsBulletin as a Student News column. Essays must be submitted via email to the Education Department at education@aana.com. 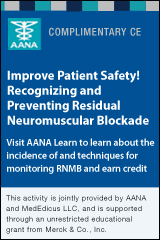 Questions may be directed to the Education Department at 847-655-1161 or education@aana.com. Ladan Eshkevari, PhD, CRNA, FAAN, has been named to the 2019 Ambassador cohort of the Friends of the National Institute of Nursing Research (FNINR). She is the first CRNA to serve in this capacity. The ambassadorship ensures that Eshkevari will be on the frontline in helping to educate state and federal policy makers on the importance of nursing research and the necessary funding required to support the health and well-being of all Americans. Learn more about the FNINR Ambassador program. Unique and rewarding opportunity for full or part-time independent contractor CRNA to join a busy CRNA-only group practice providing IV sedations to dental offices with an emphasis on pediatrics. Learn more. Sanford Health Fargo Anesthesia Department is currently seeking Certified Registered Nurse Anesthetists (CRNAs) to join its current group of 21 anesthesiologists and 72 CRNAs. Learn more. Our group of 8 anesthesiologists and 12 CRNAs has been serving the beautiful Southern Tier for over 55 years! Our group covers one large community hospital with a case load of about 10,000 cases a year. We offer a wide range of anesthesia, including orthopedics, pediatrics, obstetrics, bariatric, and cosmetic. (No hearts, heads or trauma). 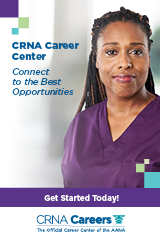 Our CRNAs enjoy a team approach to patient care and a pleasant working environment. As some of our CRNAs start looking toward retirement, we find ourselves in a position to welcome a few new members to our team! Learn more. No hearts, no heads, and little to no trauma. No micromanagement or supervision—autonomy to handle your own cases independently. Tailor your schedule to your desires with 8, 10, and 12-hour shift options available. Quality of life balance with no call. Average providers earning MGMA 90th percentile—$220,000+ with some earning in low $300,000s, plus a $20,000 signing bonus. Retention/premium rate bonus with tenure. 6 weeks of PTO increases with seniority. Traditional and nontraditional work hours - typical hours 7:00 a.m.-3:30 p.m. with no call. Wide spectrum of cases with the exception of Cardiac and Neurosurgery. The highest volumes are Orthopedics, ENT, General Surgery, OB/GYN, and Plastics. CRNAs may participate in OB cases if they are qualified/trained in OB and motivated to do so. Managing post-cesarean pain with a multimodal analgesic strategy cut opioid prescriptions at discharge by half, according to a study out of Chicago's Mount Sinai Hospital. The institution's approach combined various analgesics with nonopioid components such as nonsteroidal anti-inflammatory drugs, acetaminophen, and gabapentin; and, when needed, added hydromorphone. Investigators compared outcomes in 155 women who delivered their babies via c-section before the protocol was put in place with those of 166 mothers who underwent the procedure after the institution starting using multimodal analgesia. Findings from the retrospective chart review indicated that morphine milligram equivalents prescribed during hospitalization fell from an average of 44.9 mg before the new approach was adopted to 23.5 mg afterwards. Only 32.5 percent of patients in the latter group were released with opioids, meanwhile, versus 89 percent of those in the earlier group. Utilization of multimodal analgesia shortened the hospital stay by half a day. From "Multimodal Analgesia Model for Post–C-Section Halves Opioids Prescribed at Discharge"
Researchers assessed the impact of bilateral, intraoperative transversus abdominis plane (TAP) block on outcomes after robot-assisted distal pancreatectomy (RADP). Colleagues at Beth Israel Deaconess Medical Center in Boston conducted the retrospective case-control study as an interrupted time series, with 48 participants meeting eligibility before and 33 after TAP implementation. Patients who received TAP block with bupivacaine consumed 4.52 fewer intravenous morphine milligram equivalents than controls during the first six hours postoperatively. They also reported better numerical rating scale pain scores at both six and 12 hours after the procedure, although that benefit wore off by 24 hours post-surgery. While bupivacaine TAP block significantly lowered opioid demand and pain in RADP patients, it did not have much of an impact on postoperative morbidity and length of hospitalization. From "TAP Block Reduces Pain and Narcotic Consumption After Robot-Assisted Distal Pancreatectomy"
HPB (02/19) Solis-Velasco, Monica A.; Ore Carranza, Ana S.; Stackhouse, Kathyrn A.; et al. Researchers evaluated intravenous amisulpride, a dopamine D2/D3-antagonist, as a rescue medication for when antiemetics fail to prevent postoperative nausea or vomiting. The target population for their prospective, multinational trial was adults who experienced this adverse effect within 24 hours of surgery under general inhalational anesthesia, despite having received standard antiemetics. About 700 patients meeting this profile were randomly allocated to treatment with 5 or 10 mg of amisulpride or matching placebo. The primary endpoint was complete response, meaning no emesis or need for rescue antiemetics for 24 hours after taking amisulpride, except within the first 30 minutes. This outcome was achieved by 41.7 percent of patients in the 10 mg group, 33.8 percent of patients in the 5 mg group, and 28.5 percent of the controls. The results show that 10 mg of amisulpride is superior to placebo in alleviating established postoperative nausea or vomiting in patients for whom antiemetics did not provide sufficient prophylaxis. Cutting the dosage in half, however, eliminated the benefit. From "Amisulpride for the Rescue Treatment of Postoperative Nausea or Vomiting in Patients Failing Prophylaxis"
Anesthesiology (Winter 2019) Vol. 130, No. 2, P. 203 Habib, Ashraf S.; Kranke, Peter; Bergese, Sergio D.; et al. The Society for Pediatric Anesthesia Improvement Network reports results from its inaugural study, which focused on minimally invasive repair of pectus excavatum (MIRPE). The researchers set up a multicenter observational database to characterize the analgesic techniques used for children undergoing the procedure. They then drew on outcome data from 348 patients at 14 participating centers in order to evaluate the relationship between different analgesic approaches and pain. The findings highlight a range of pain management options for MIRPE patients, including epidural catheter (EC), paravertebral catheter, wound catheter, no regional analgesia, and intrathecal morphine. While the data suggests that most children will experience mild-to-moderate postoperative pain regardless of the analgesic approach, managing them with EC appears to lower pain scores and curb opioid requirements in the early recovery stage more so than the other treatment strategies. From "Perioperative Management and In-Hospital Outcomes After Minimally Invasive Repair of Pectus Excavatum"
Anesthesia & Analgesia (02/19) Vol. 128, No. 2, P. 315 Muhly, Wallis T.; Beltran, Ralph J.; Bielsky, Alan; et al. While bupivacaine and levobupivacaine are commonly used in spinal anesthesia, researchers in Spain wondered if one medication was riskier to older patients than the other. Specifically, they were interested in differences in regional cerebral O2 saturation, cognitive status, and neurological outcomes. The team assembled a study population of 58 patients, aged 70 years and older, having surgery to repair a hip fracture. Participants were evenly and randomly divided into two groups—one that received levobupivacaine and one that received bupivacaine, both combined with fentanyl and both delivered intrathecally. The main outcome was the percentage of intraoperative time with regional cerebral desaturation, which did not differ significantly between groups. Additionally, there was no meaningful difference in cognitive impairment as measured by changes in the Short Portable Mental Status Questionnaire. Neurological complications, however, were more prevalent with patients who received bupivacaine—half of whom were affected, versus fewer than a quarter of those who received levobupivacaine. The researchers also observed different levels of sensory and motor block achieved with the two drugs. From "Effects of Bupivacaine or Levobupivacaine on Cerebral Oxygenation During Spinal Anesthesia in Elderly Patients Undergoing Hip Surgery"
BMC Anesthesiology (01/31/19) Vol. 19, No. 17 Vives, Roser; Fernandez-Galinski, Diana; Gordo, Francisca; et al. Surgical fires under monitored anesthesia care (MAC) are rare but can be avoided altogether, report the authors of a systematic review. The literature search included English-language studies in the past 10 years that focused on MAC surgeries of the head, neck, and face. The researchers turned up six relevant studies with a collective 31 participants as well as one questionnaire-style study with more than 8,500 respondents. According to the evidence, MAC procedures are vulnerable to fire due to high oxygen delivery using nasal cannulas or other open gas devices. When fires break out in the OR during these operations, they typically involve the pooling of oxygen beneath surgical drapes or within the operative site. Anesthesia providers can reduce the risk of fire, however, by lowering oxygen saturation. Ways to accomplish this include using a vacuum to reduce oxygen levels around the patient's face; limiting oxygen flow rates to less than 4 L per minute; using a blower to increase ventilation under head drapes meant to maintain body temperature; and observing a safe physical distance between ignition sources and oxygen. "These interventions aim to reduce the available oxidizer in the surgical field and can be readily performed by the anesthetist provider to help reduce the risk of a surgical fire," said researcher Izaskun Green, RN, a student at Miami's Florida International University. From "Under-Drape Suctioning, Minimal Oxygen Delivery Decreases Risk for OR Fires"